Step-thru comfort - Bike it Now! Step-thru comfort - Bike it Now! It is important for us to have a step through bike available for those people who would like a step through frame with a more upright riding style. 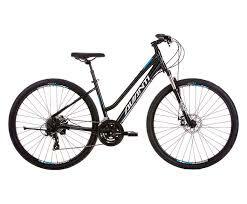 The Avanti Discovery 3 is; 27 speed with Hydraulic disc brakes and has suspension in the seat post.